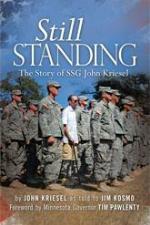 Still Standing: The Story of SSG John Kriesel is not just another war story. This is the story of an ordinary young man who overcame extraordinary challenges with a lot of help from others, including many strangers, and he emerged stronger and more in love with his country, his wife, his children, and, ultimately, his own life. April Michelle Davis of Editorial Inspirations was hired to proofread this book, and it was a pleasure. The stories within this book were gripping and highly emotional. Even though I was analyzing the text and layout, I could feel the powerful message coming from the author’s voice. This entry was posted on Tuesday, October 1st, 2013 at 12:00 pm and is filed under Featured Titles. You can follow any responses to this entry through the RSS 2.0 feed. Responses are currently closed, but you can trackback from your own site.